Reese’s Peanut Butter Oat Bars – Loaded with peanut butter, sweetened condensed milk, and chocolate, these decadent bars are sure to satisfy any sweet tooth! I love anything caramel, peanut butter, or chocolate. So hand me something that incorporates all three into one and I’ll definitely be a happy camper. 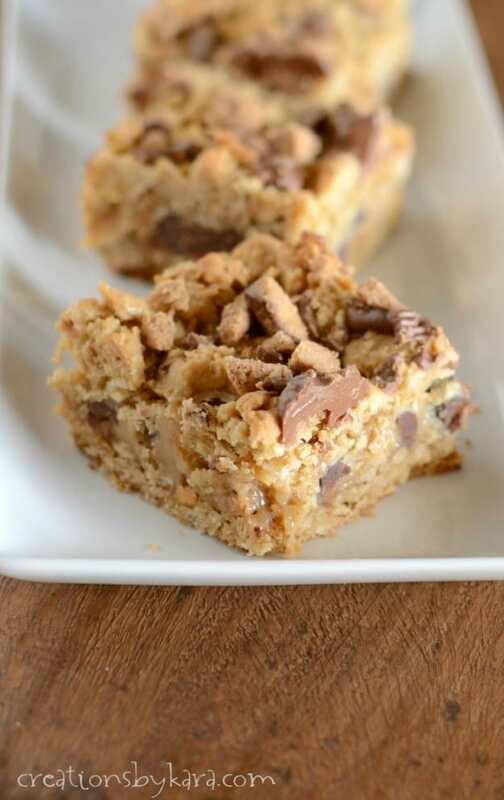 These yummy bars are like eating a candy bar. Except better, because they are made with all fresh ingredients from your very own kitchen. They are sooo good! I recommend using semi sweet chocolate chips in this recipe. They help balance out that ooey gooey caramel layer that forms as the sweetened condensed milk bakes. And the oats add a nice hearty crunch. 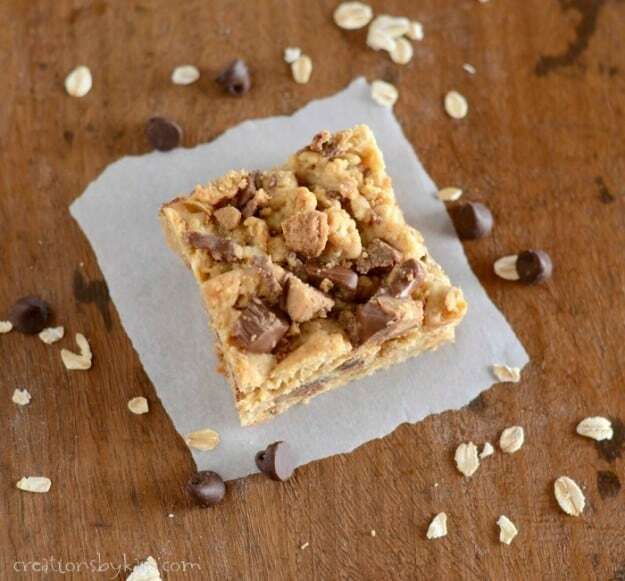 Give these bars a try, I bet you’ll love ’em! 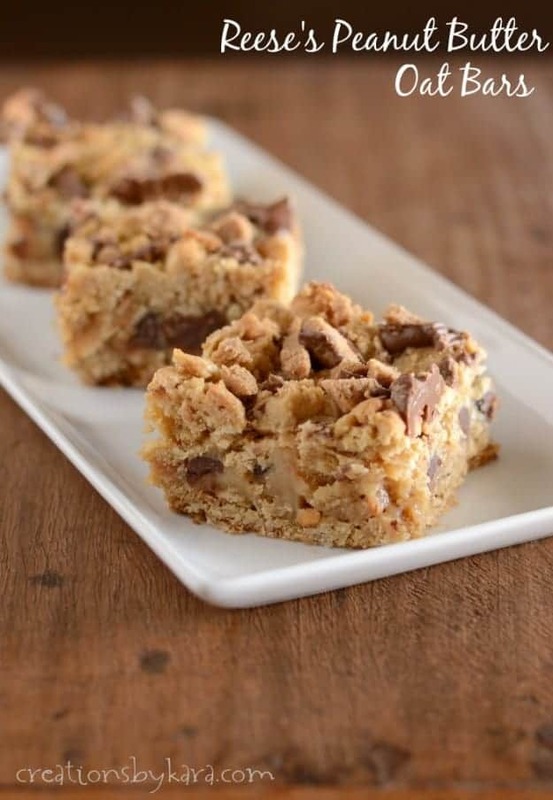 Ooey gooey oat bars with peanut butter, chocolate chips, and Reese's peanut butter cups. Cream butter and brown sugar in a large mixing bowl. Beat in eggs and vanilla. Stir in the flour, soda, salt, and oats till well combined. Press half of dough into a greased 9x13" pan. Whisk together sweetened condensed milk and peanut butter till smooth. Pour over dough. Sprinkle with chocolate chips. Crumble remaining dough over the top of the filling. Sprinkle with the chopped peanut butter cups. Bake at 350° for 25-30 minutes, or till golden brown.